Join us for OSUD's 40th season! 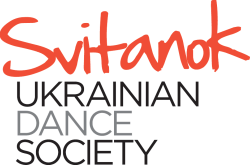 The Ottawa School of Ukrainian Dance offers Ukrainian dance instruction to students of all ages and levels. Children as young as 3 begin in the You and Me class accompanied by a parent, guardian, or adult friend. At age four, children register for the Primary class - an introduction to Ukrainian rhythms, music, and dance. Students progress through the School, working for two years at each level. Students can begin learning in the School at any age (age of student is determined as of Dec. 31, 2018). All classes are held in professionally-equipped dance studios at The School of Dance, 200 Crichton Street (in New Edinburgh off the Vanier Parkway). Below is a list of OSUD classes, held each Sunday, with related ages, class times, and fees. *More experienced dancers may wish to audition for the Svitanok Ensemble. As a 40th anniversary project, the Ottawa School of Ukrainian Dance will establish a School Ensemble this year. Molodtsi!, a young, preparatory ensemble, will provide additional training to School students from the Intermediate level on up. The focus will be on performance, with performing opportunities on the menu. Adults at any level of experience can register for Podorozh!, the School's adult program. Join us for weekly classes or register on a "drop-in" basis. Our second annual series of special Podorozh! workshops will be announced shortly - for anyone wishing to connect into an exciting world of movement, health and wellness, Ukrainian culture and contemporary life. A 12-week program that focuses on improving and refreshing technique at an advanced level. For Svitanok Ensemble dancers, alumni dancers and other experienced dancers.